In the Booth is the most established Photo Booth Hire company in Melbourne. We love attending events in the greater Melbourne area from Geelong all the way around to the Mornington Peninsula. Complimented by our team in the Eastern Suburbs and Yarra Valley, our Melbourne West team focuses on events in the CBD, Central Melbourne, and West to Geelong and beyond. Corporate Events, Weddings, Parties and just about any other function you can think of has probably been attended by an In the Booth Photobooth! Our booths offer the perfect mix of classic photobooth beauty with a timeless retro exterior, together with industry leading software and digital features. Social media sharing is at our guests fingertips through our integrated free mobile app, and custom branding options allow the booth to be completely themed to suit any situation. Melbourne is renowned for its multiculturalism and its eclectic food & coffee culture. We are a city that loves to be out celebrating life, whether it’s a wedding, party, festival or some other function. Melbourne and its surrounds offer a wide variety of restaurants, wineries, cafes and funky industrial venues for a kaleidoscope of events. Our photo booth compliments all of these with aplomb due to its clever design – from the vintage wedding to the funky restaurant party or corporate shindig, we have Melbourne photo booth hire covered! Brett and Sam love what Melbourne has to offer and are committed to providing the highest standard of photo booth hire available. Hi, we’re Brett & Sam from In the Booth Melbourne photo booth hire! We have been a part of the In the Booth team since 2014, and love making special events awesome! It’s fantastic getting to meet so many people and be a part of their celebrations every week. When we’re not boothing, we love spending time with our two girls and Brett loves cooking up a real BBQ feast 🙂 Our constant aim is to delight all of our clients with awesome service and the best photo booth experience possible. We continue to be blessed with fantastic feedback from people who have just loved having the booth at their event. For the last 3 years, we have had the privilege of being awarded best photobooth in both Victoria and Australia by the Australian Bridal Industry Association, thanks to the feedback of our wonderful clients. In the Booth is now rated as an ABIA Ambassador. To arrange photo booth hire in Melbourne, and make your special night one to remember, please get in touch. "Thank you so much for the sneak peak reel. It was awesome and we’re very excited to see all the snaps! We also wanted to thank you for providing such an amazing service. We used the photo booth as our bonbonniere and we were just thrilled with how popular it was on the night! We have had nothing but great feedback from our guests and it really added a different feel to the night. It made our wedding a definite stand out. I was surprised with how easy it was to use – even our older guests were getting into it – and we had tables of 10-12 guests able to fit in to take table shots which was fantastic. The attendant (I think his name was Chris?) was fantastic as well. He was very accommodating and polite, even when dealing with some of our merrier guests! After seeing how much our friends enjoyed the booth, and the package inclusions, it’s clear it is exceptional value for money. We would be thrilled to recommend you to our family and friends. Thank you again for making our wedding so memorable for us and our guests." "We would just love to Thankyou for everything you did for us for our wedding at Carousel Albert Park Lake on Friday 11th October. We had an absolutely amazing day that was just perfect in every way. We have been to weddings before that have used photobooths but In The Booth was by far the best booth we have both seen. From booking with you guys and the ease of picking the best package/ backdrop and options, to the set up and appearance of the booth and how it was run was just perfect for us. So easy and no hassle. Everything was communicated to us before hand really well and ran so smoothly on the night. Every-time we looked over to the booth there was a huge line to get in, lucky for us we got straight to the front every time ? Everybody loved it. The added bonus of the album is a fantastic idea. It was amazing to go through all the photos the next day. Its great because you don’t get your photos back for a while so to have the ones from the booth is fantastic. It really shows peoples personalities and how much fun they had. Thankyou so much again, We will be recommending you to everyone we know." 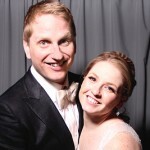 What is it you love about providing Melbourne photo booth hire services? Melbourne offers so many fantastic wedding and event venues that complement our booth. When guests arrive in the room to see the views, decor, table settings and of course our photo booth, melbourne locals feel so special. I am proud to stand tall beside the photo booth and welcome them inside for memory making fun! Tell us about some uniquely Melbourne touches you have seen at an event? I love the Multicultural lifestyle in Melbourne. So many old traditions are given life by the new generation of Brides and Grooms. Big bands playing to European dances that encourage the entire room to celebrate with family and friends. It’s a real sight to see. When guests ask me to get in the photo booth. Melbourne, beware, I love to get in the booth, so be prepared for some real photo booth action shots with your attendant! Focus on the memories. I think guests want to have something special to remember. So many photos now live on our device and we often forget to enjoy them after the event. 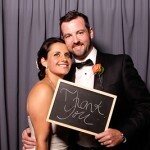 With a photo booth Melbourne brides and their guests have a keepsake that is put on the fridge or kept in their purse and the moment can be relived over again. Visit the CBD laneways to explore the street art. Sam is an avid street art fan and loves to discover new techniques used by street artists. Stenciling is her favourite at the moment and you can see some great examples in the likes of AC/DC lane, just off Flinders Lane. There is even organised tours if you really want the full experience!